If you’ve ever paused, like me, along Harbor Island on a summer evening and wondered why there were so many sailboats darting about San Diego Bay, wonder no more. Being a powerboater, I knew nothing about the sail racing world. When offered an invitation to observe the summer races’ kickoff aboard the media boat I jumped at the opportunity to learn more. What you’re witnessing Wednesday evenings is the Beer Can Races, a San Diego institution dating back 36 years. That’s when a group of sailors got together over a few beers and decided to start their own series of weekly casual summer “beer can” sailboat races as many other coastal cities had done. Beer Can racers, both women and men, are passionate about their sport, I discovered. The new races quickly gained popularity and growing participation, with the competition soon overshadowing the social aspect. 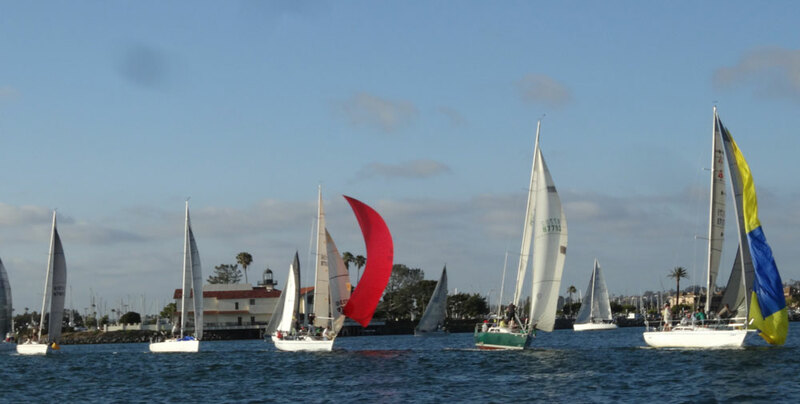 After about a year the Cabrillo Racing Association formed and became chief organizer, providing needed structure as the racing became more serious, explained Commodore Mark Clements. While San Diego’s version began in 1979, other series preceded them. San Francisco’s Golden Gate Yacht Club’s Beer Cans date to 1965 and Corona del Mar’s at the Balboa Yacht Club began in the mid-1950s. The founding of each series began – of course! – over a few beers. Traditionally Beer Cans are held on a mid-week summer evening for 10 weeks, with racing starting after work and finishing before dark. Each week a camaraderie-filled post-race party features food, drinks and the week’s trophy presentation, rotating around San Diego’s marinas and waterfront restaurants. Friendship and fun are as essential to the Beer Cans as the competition. “One of the biggest and most important aspects (of the Beer Cans) is to invite guests along to participate. It’s an opportunity to share the love of yacht racing with friends and family,” Clements said. Following the final race two trophies are awarded, one for the best of all 10 races and, for participants who’ve missed a few, for the best of seven. This year’s Bear Can Races kicked off just before 6 p.m. May 27, an evening featuring calm seas, clear skies and light winds following a day of intense May Gray. The media boat delivered me close enough to the starting line to observe the teamwork involved in racing sailing yachts. Crews hauled on their sheets as they tacked to make tight turns around markers on their designated course, while on some boats crew members dangled their legs over the sides to reduce heeling. Captains had learned their boats’ assigned courses only 5 minutes before each race’s starting gun, Clements said. While awaiting pickup at the Bali Hai dock I chatted with Brian Buffalo, crewing on the Sea Maiden. He explained that boats don’t have to participate in every race, but lose points for missing races, and that crew members can change from week to week. Beer Can sailors’ skills and experience vary from novice to top-notch, with many sailors like himself having competed at the Olympic level. Larger, higher performance vessels, he said, can have as many as 20 crew and sail a longer course than smaller boats. “Some of the best sailors in the world are here Wednesday nights,” Clements said, including internationally-ranked sailors J.J. Isler, Russell Coutts and current America’s Cup winner James Spithill, with four-time America’s Cup champion Dennis Conner a regular participant. This year 125 sailboats, with most from 24 to 60 feet, are competing in nine classes over 2 to 16 mile courses. ← Dock Lines: What’s going on with the San Salvador launch?